This dialog is displayed if the body was not healed %100. Through the dialog options, you can specify the next step in the healing process. Yes, Continue Healing Interactively – When selected, the Healing Wizard will attempt to heal the model interactively. No, Save Partially Healed Model and End the Wizard – When selected, what changes were made to the model will be saved, and the healing session will end. 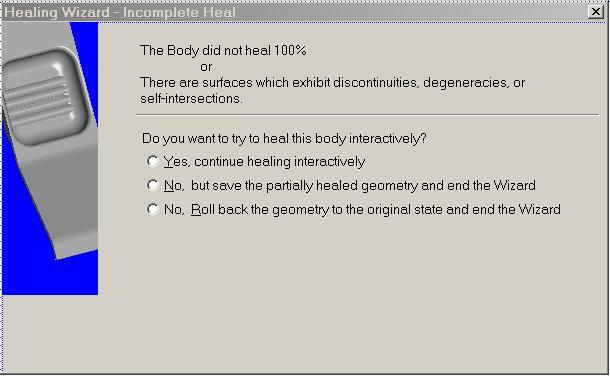 No, Roll Back the Geometry to Original State and End the Healing Wizard – When selected, the geometry will be ”r;rolled back” to its original state (changes made by the heal attempt will not be saved) and the healing session will end.